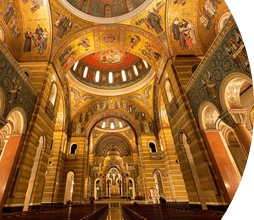 St. Louis is designed to please the whole family during a fast-paced 2016 getaway. In beautiful Forest Park, the region’s top attractions are packed with family activities and open free of charge. The park is home to the Missouri History Museum, where the new History Clubhouse invites young travelers to explore the past with hands-on activities. Adorable Kali lives in the Saint Louis Zoo’s spectacular new Polar Bear Point habitat. Watch him swim and play nose to nose through underwater viewing windows. 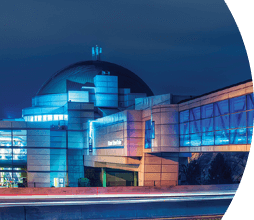 The world of science stars at the McDonnell Planetarium and Saint Louis Science Center. A real Egyptian mummy and ancient armor are highlights at the Saint Louis Art Museum where family art programs are held every Sunday. 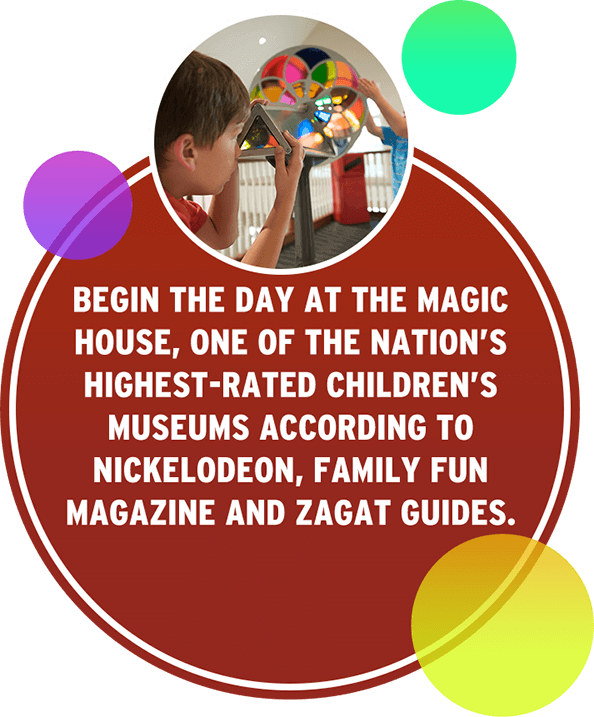 Begin the day at The Magic House, one of the nation’s highest-rated children’s museums according to Nickelodeon, Family Fun magazine and Zagat guides. Animal lovers can explore Grant’s Farm and Purina Farms, both open free, where they can interact with domestic and exotic animals from around the globe. A visit to the World Bird Sanctuary and the Endangered Wolf Center teaches young visitors about conservation in the wild. In Faust Park, kids will want to ride the historic hand-carved carousel and marvel at the Butterfly House, home to more than 2,000 of the colorful, fluttering insects. At the Museum of Transportation, every child’s fascination with trains and cars is satisfied with a huge collection of rolling stock. The whole family will love seeing the World’s Largest Chess Piece, located between the World Chess Hall of Fame and the Chess Club and Scholastic Center of Saint Louis. The Missouri Botanical Garden’s Children’s Garden is a playground with a purpose as kids learn about plant life while having fun. Race around Six Flags St. Louis on the theme park’s thrilling rides, including last year’s new ride: Justice League: Battle for Metropolis. Raging Rivers water park hugs the banks of the Mississippi River for great views along the Meeting of the Great Rivers scenic byway. 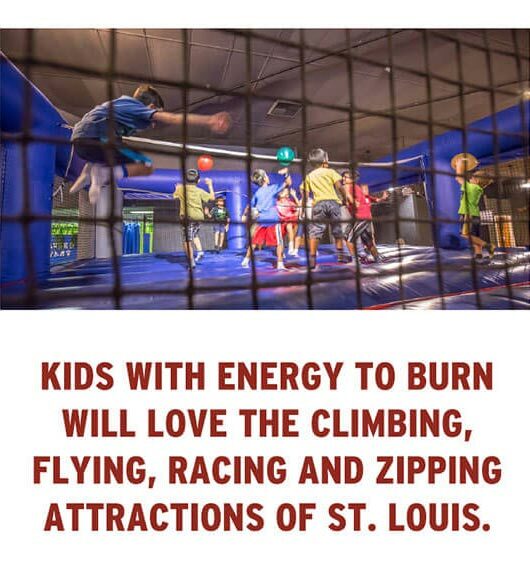 Kids with energy to burn will love the climbing, flying, racing and zipping attractions of St. Louis. Take to the high wire with classes or single-swing adventures at the Circus Harmony Flying Trapeze Center at St. Louis Union Station. Zip through Creve Coeur Park on the Go Ape! Zip Line. Visit the Caveman Zip Line at Meramec Caverns to whoosh across a scenic river or enjoy the view at the Grafton Zip Line at Aerie’s Winery. Kids will roar into the winner’s circle at Pole Position Raceway, an indoor karting attraction. Chesterfield Sports Fusion includes multiple levels of indoor fun with laser tag, mini-golf, dodgeball, rock walls, sport courts and an obstacle course. In downtown St. Louis, City Museum reveals a hands-on world of recycled, artsy fun where kids and adults can climb, slide, create and play in a giant warehouse of adventure. Budding hedge-fund managers will be thrilled with the Inside the Economy Museum at downtown’s Federal Reserve Bank. 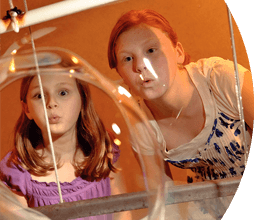 The scientifically fun Myseum encourages youngsters from ages two to 12 to learn about the physical world with hands-on experiments disguised as pure entertainment. Winter brings snow to Hidden Valley Ski.Tube.Ride. where everyone can hit the slopes on traditional skis, snowboards or fast-paced tubes. Cold weather also signals the arrival of The Polar Express train ride at St. Louis Union Station in November and December. Ice skating on the frozen surfaces of Steinberg or Shaw Park rinks releases everyone’s inner ice princess when the temperatures drop. 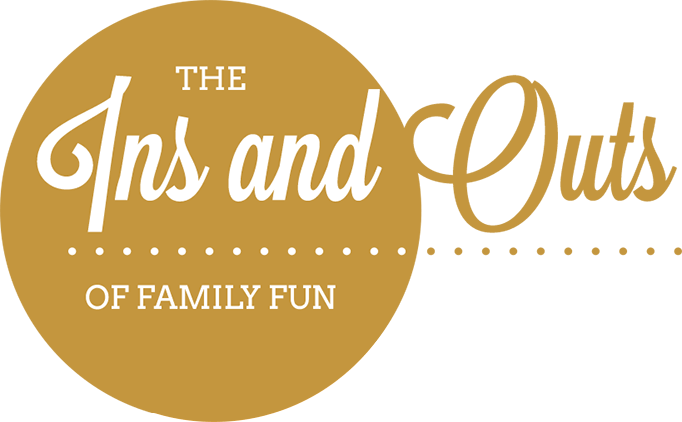 Get more information for a great getaway for kids in St. Louis!